For other storms of the same name, see Tropical Storm Harvey. Hurricane Harvey of 2017 is tied with 2005's Hurricane Katrina as the costliest tropical cyclone on record, inflicting $125 billion in damage, primarily from catastrophic rainfall-triggered flooding in the Houston metropolitan area and Southeast Texas. It was the first major hurricane[nb 1] to make landfall in the United States since Wilma in 2005, ending a record 12-year span in which no hurricanes made landfall at the intensity of a major hurricane throughout the country. In a four-day period, many areas received more than 40 inches (1,000 mm) of rain as the system slowly meandered over eastern Texas and adjacent waters, causing unprecedented flooding. 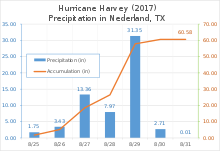 With peak accumulations of 60.58 in (1,539 mm), in Nederland, Texas, Harvey was the wettest tropical cyclone on record in the United States. The resulting floods inundated hundreds of thousands of homes, which displaced more than 30,000 people and prompted more than 17,000 rescues. The eighth named storm, third hurricane, and first major hurricane of the extremely active 2017 Atlantic hurricane season, Harvey developed from a tropical wave to the east of the Lesser Antilles, reaching tropical storm status on August 17. 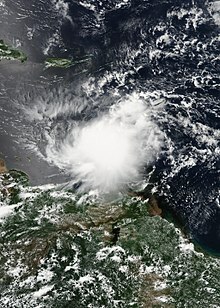 The storm crossed through the Windward Islands on the following day, making landfall on the southern end of Barbados and a second landfall on Saint Vincent. Upon entering the Caribbean Sea, Harvey began to weaken due to moderate wind shear, and degenerated into a tropical wave north of Colombia, late on August 19. The remnants were monitored for regeneration as it continued west-northwestward across the Caribbean and the Yucatán Peninsula, before redeveloping over the Bay of Campeche on August 23. Harvey then began to rapidly intensify on August 24, regaining tropical storm status and becoming a hurricane later that day. While the storm moved generally northwest, Harvey's intensification phase stalled slightly overnight from August 24–25; however, Harvey soon resumed strengthening and quickly became a major hurricane and attained Category 4 intensity later that day. Hours later, Harvey made landfall at San José Island, Texas, at peak intensity, followed by another landfall at Holiday Beach at Category 3 intensity. Afterwards, rapid weakening ensued, and Harvey had downgraded to a tropical storm as it stalled near the coastline, dropping torrential and unprecedented amounts of rainfall over Texas. On August 28, it emerged back over the Gulf of Mexico, strengthening slightly before making a fifth and final landfall in Louisiana on August 29. As Harvey drifted inland, it quickly weakened again as it became extratropical on September 1, before dissipating two days later. Harvey caused at least 107 confirmed deaths: 1 in Guyana, and 106 in the United States. Total damage from the hurricane is estimated at $125 billion (2017 USD), making it among the costliest natural disasters ever in the United States, comparable with Hurricane Katrina in 2005. Hurricane Harvey originated from a westward-moving tropical wave that emerged from Africa over the eastern Atlantic Ocean, on August 12, 2017. A surface circulation slowly developed and convection consolidated around the low over the subsequent days; the system became a tropical depression on August 17, roughly 505 mi (815 km) east of Barbados. Maintaining its brisk westward motion, the system strengthened slightly and became a tropical storm later that day, at which time it was assigned the name Harvey. With maximum sustained winds of 45 mph (75 km/h), Harvey made landfalls in Barbados and St. Vincent on August 18 before entering the Caribbean Sea. Hostile environmental conditions, namely wind shear, imparted weakening and caused Harvey to degenerate into a tropical wave by August 19. Though it lacked an organized surface low, the remnants of Harvey continued to produce significant convection as it traversed the Caribbean Sea and Yucatán Peninsula. The system reached the Bay of Campeche in the Gulf of Mexico on August 23 and soon consolidated around a new surface low. Late on August 23, the remnants of Harvey regenerated into a tropical cyclone and reattained tropical storm intensity by 18:00 UTC. Initial reorganization was slow; however, within a highly favorable environment, the system soon underwent rapid intensification as an eye developed and its central pressure quickly fell. 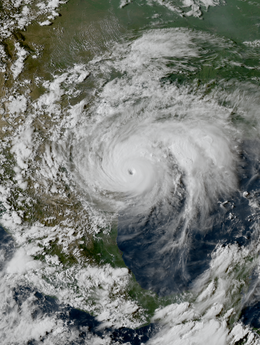 After becoming a hurricane on August 24, Harvey continued to quickly strengthen over the next day, ultimately reaching peak intensity as a Category 4 hurricane. Around 03:00 UTC on August 26, the hurricane made landfall at peak intensity on San Jose Island, just east of Rockport, with winds of 130 mph (215 km/h) and an atmospheric pressure of 937 mbar (27.7 inHg). It made a second landfall on the Texas mainland, at Rockport, three hours later in a slightly weakened state. Harvey became the first major hurricane to make landfall in the United States since Wilma in 2005. After striking land, Harvey rapidly weakened as its speed slowed dramatically to a crawl, and Harvey weakened to a tropical storm on August 26. For about two days the storm stalled just inland, dropping very heavy rainfall and causing widespread flash flooding. Harvey's center drifted back towards the southeast, ultimately re-emerging into the Gulf of Mexico on August 28. Once offshore, the poorly organized system struggled against strong wind shear. Deep convection persisted north of the cyclone's center near the Houston metropolitan area along a stationary front, resulting in several days of record-breaking rain. Early on August 30, the former hurricane made its fifth and final landfall just west of Cameron, Louisiana with winds of 45 mph (75 km/h). Associated convection with Harvey became focused north of the center and along a warm front on September 1 as it moved further inland, indicating that the system transitioned into a post-tropical cyclone by 06:00 UTC that day. The remnants continued northeastwards, before being absorbed into another extratropical system on September 3. Tropical cyclone warnings and watches for the Windward Islands were issued starting at 15:00 UTC on August 17, about six hours before Harvey developed. At that time, a tropical storm watch was posted for Dominica, while a tropical storm warning became in effect in Barbados, Martinique, Saint Lucia, and Saint Vincent and the Grenadines. All watches and warnings were discontinued by late on August 18, as the storm continued westward into the Caribbean. In Honduras, a green alert was issued for the Atlántida, Islas de la Bahía, Colón, Cortés, Gracias a Dios, Olancho, and Yoro departments. About 8 inches (200 mm) of precipitation was expected along the coast, while inland areas were forecast to receive 2.76 to 3.15 in (70 to 80 mm) of rain. As the remnants of Harvey approached Mexico, the Civil Protection Secretary of the state of Campeche issued a blue alert, indicating minimal danger. When Harvey redeveloped at 15:00 UTC on August 23, the Government of Mexico issued a tropical storm watch in Tamaulipas from Boca De Catan to the mouth of the Rio Grande. The watch remained in effect until 21:00 UTC on August 25, after it became evident that the storm no longer posed a significant threat to that area. FEMA worked with the Coast Guard, Customs and Border Protection, and Immigration and Customs Enforcement to prepare for the storm and its aftermath. The agency placed disaster response teams on standby at emergency posts in Austin, Texas, and Baton Rouge, Louisiana. Upon the NHC resuming advisories for Harvey at 15:00 UTC on August 23, a hurricane watch was issued in Texas from Port Mansfield to San Luis Pass, while a tropical storm watch was posted from Port Mansfield south to the mouth of the Rio Grande and from San Luis Pass to High Island. Additionally, a storm surge watch became in effect from Port Mansfield to High Island. Additional watches and warnings were posted in these areas at 09:00 UTC on August 24, with a hurricane warning from Port Mansfield to Matagorda; a tropical storm warning from Matagorda to High Island; a hurricane watch and tropical storm warning from Port Mansfield to the Rio Grande; a storm surge warning from Port Mansfield to San Luis Pass; and a storm surge from Port Mansfield to the Rio Grande. As the hurricane neared landfall on August 24, an extreme wind warning—indicating an immediate threat of 115–145 mph (185–235 km/h) winds—was issued for areas expected to be impacted by the eyewall; this included parts of Aransas, Calhoun, Nueces, Refugio, and San Patricio counties. The watches and warnings were adjusted accordingly after Harvey moved inland and began weakening, with the warning discontinued at 15:00 UTC on August 26. By 09:00 UTC on the following day, only a tropical storm warning and a storm surge warning remained in effect from Port O'Connor to Sargent. However, watches and warnings were re-issued as Harvey began to re-emerge into the Gulf of Mexico, and beginning at 15:00 UTC on August 28, a tropical storm warning was in effect for the entire Gulf Coast of Texas from High Island northward. Governor Greg Abbott declared a state of emergency for 30 counties on August 23, while mandatory evacuations were issued for Brazoria, Calhoun, Jackson, Refugio, San Patricio, and Victoria counties, as well as parts of Matagorda County. On August 26, Governor Abbott added an additional 20 counties to the state of emergency declaration. Furthermore, the International Charter on Space and Major Disasters was activated by the USGS on behalf of the Governor's Texas Emergency Management Council, including the Texas Division of Emergency Management, thus providing for humanitarian satellite coverage. In Louisiana, Governor John Bel Edwards declared a state of emergency for the entire state. A mandatory evacuation was ordered in Cameron Parish for the cities of Big Lake, Cameron, Creole, Grand Chenier, Hackberry, Holly Beach, and Johnson Bayou. Additionally, a voluntary evacuation was ordered in Vermilion Parish for low-lying areas south of State Highway 14. The Louisiana National Guard prepared about 500,000 sandbags and emergency boats and high-water-rescue vehicles were placed on standby should flooding occur. In New Orleans, there were concerns about whether or not the city's drainage system could handle a heavy rainfall event, with only 105 of the 120 water pumps being operational and some power turbines being out of service. The city's public schools, as well as six universities and a medical school, closed on August 29. As Harvey began re-emerging into the Gulf of Mexico on August 28, the tropical storm warning in Texas from Mesquite Bay to High Island was extended eastward into Louisiana to the community of Cameron at 12:00 UTC, while a tropical storm watch was issued from Cameron to Intracoastal City. Winds left residents throughout Barbados without electricity, with a majority of outages occurring in Christ Church, Saint Joseph, Saint Lucy, and Saint Michael provinces. Flooding washed one house off its foundation, while water entered some houses, forcing some people to evacuate. Bridges in Saint Andrew and Saint Joseph were damaged. Additionally, a fuel depot in Speightstown was flooded. Winds from Harvey ripped the roof off of a church. In Saint Vincent and the Grenadines, nine homes were flooded and four others experienced wind damage. Also, a tree fell on a school, damaging the building. Blocked drains in Port Elizabeth resulted in more than 15 businesses being flooded. A total of 15 people were housed in shelters after the storm. Strong winds and heavy rainfall also affected Suriname and Guyana. In the former, high winds in the capital city of Paramaribo caused roof damage to the Presidential Palace and two homes, while the Torarica Hotel and Casino suffered structural impact. Additionally, four dwellings were deroofed in Commewijne and three others lost their roofs in Wanica; in the latter, the Ministry of Social Affairs building was damaged by falling trees. In Guyana, the village of Jawalla bore the brunt of the storm. Four homes were demolished, while five other residences and two shops were damaged. Several public buildings were also damaged, including the community center, the village council buildings, the nursery, and public schools. A 29-year-old woman died after her house collapsed on her. The widespread and catastrophic effects of Hurricane Harvey resulted in one of the costliest natural disasters in United States history. An estimated 300,000 structures and 500,000 vehicles were damaged or destroyed in Texas alone. The National Oceanic and Atmospheric Administration estimated total damage at $125 billion, with a 90% confidence interval of $90–160 billion. The scope of flooding in areas with low National Flood Insurance Program (NFIP) participation lends to the large uncertainty in the damage total. This ranks Harvey as the costliest tropical cyclone on record in the country alongside Hurricane Katrina in 2005. However, accounting for inflation and cost increases since 2005, the National Hurricane Center considers Harvey the second-costliest. Nationwide, 107 people died in storm-related incidents: 103 in Texas, 2 in Arkansas, 1 in Tennessee, and 1 in Kentucky. Of the deaths in Texas, 68 were from the direct effects of Harvey, the highest such number in the state since 1919. Throughout Texas, approximately 336,000 people were left without electricity and tens of thousands required rescue. Throughout the state, 103 people died in storm-related incidents: 68 from its direct effects, including flooding, and 35 from indirect effects in the hurricane's aftermath. By August 29, 2017 approximately 13,000 people had been rescued across the state while an estimated 30,000 were displaced. The refinery industry capacity was reduced, and oil and gas production was affected in the Gulf of Mexico and inland Texas. On Monday, the closure of oil refineries ahead of Hurricane Harvey created a fuel shortage. Panicked motorists waited in long lines. Consequently, gas stations through the state were forced to close due to the rush. More than 20 percent of refining capacity was affected. More than 48,700 homes were affected by Harvey throughout the state, including over 1,000 that were completely destroyed and more than 17,000 that sustained major damage; approximately 32,000 sustained minor damage. Nearly 700 businesses were damaged as well. Yet the Texas Department of Public Safety stated more than 185,000 homes were damaged and 9,000 destroyed. The hurricane also caused many people to believe that in the wild, only 10 individuals of Attwater's prairie chicken remained at most until spring 2018 when it was discovered that there were about a dozen wild individuals left. Making landfall as a Category 4 hurricane, Harvey inflicted tremendous damage across Aransas County. Wind gusts were observed up to 132 mph (212 km/h) near Port Aransas. 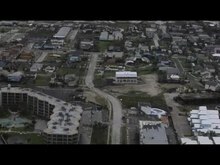 Nearly every structure in Port Aransas was damaged, some severely, while significant damage from storm surge also occurred. In Rockport, entire blocks were destroyed by the hurricane's violent eyewall winds. The city's courthouse was severely damaged when a cargo trailer was hurled into it, coming to a stop halfway through the structure. The gymnasium of the Rockport-Fulton High School lost multiple walls while the school itself suffered considerable damage. Many homes, apartment buildings, and businesses sustained major structural damage from the intense winds, and several were completely destroyed. Numerous boats were damaged or sunk at a marina in town, airplanes and structures were destroyed at the Aransas County Airport, and a Fairfield Inn in the city was severely damaged as well. One person died in a house fire in the city, unable to be rescued due to the extreme weather conditions. Just north of Rockport, many structures were also severely damaged in the nearby town of Fulton. In the small community of Holiday Beach, catastrophic damage occurred as almost every home in town was severely damaged or destroyed by storm surge and violent winds. By the afternoon of August 26, more than 20 in (510 mm) of rain had fallen in the Corpus Christi metropolitan area. All of Victoria was left without water and most had no power. Many locations in the Houston metropolitan area observed at least 30 in (760 mm) of precipitation, with a maximum of 60.58 in (1,539 mm) in Nederland. This makes Harvey the wettest tropical cyclone on record for both Texas and the United States, surpassing the previous rainfall record held by Tropical Storm Amelia. The local National Weather Service office in Houston observed all-time record daily rainfall accumulations on both August 26 and 27, measured at 14.4 in (370 mm) and 16.08 in (408 mm) respectively. Due to the amount of rain accumulated from Harvey, the National Weather Service added 2 new colors to the rain index representing around 50% of the maximum rainfall dropped by Harvey. Multiple flash flood emergencies were issued in the Houston area by the National Weather Service beginning the night of August 26. In Pearland, a suburb south of Houston, a report was made of 9.92" of rainfall in 90 minutes. The 39.11 in (993 mm) of rain in August made the month the wettest ever recorded in Houston since record keeping began in 1892, more than doubling the previous record of 19.21 in (488 mm) in June 2001. The storm surge peaked at 6 feet at Port Lavaca, reducing outflow of rainwater from land to sea. During the storm, more than 800 Houston area flights were canceled, including 704 at George Bush Intercontinental Airport and 123 at William P. Hobby Airport. Both airports eventually closed. Several tornadoes were spawned in the area, one of which damaged or destroyed the roofs of dozens of homes in Sienna Plantation. As of August 29, 14 fatalities have been confirmed from flooding in the Houston area, including 6 from the same family who died when their van was swept off a flooded bridge. A police officer drowned while trying to escape rising waters. Enlarged map of rainfall from the hurricane in the Houston and Beaumont metropolitan areas in southeast Texas. Areas in blue indicate accumulations in excess of 15 in (380 mm), while areas in yellow indicate accumulations in excess of 40 in (1,000 mm). An estimated 25–30 percent of Harris County—roughly 444 mi2 (1,150 km2) of land—was submerged. Late on August 27, a mandatory evacuation was issued for all of Bay City as model projections indicated the downtown area would be inundated by 10 ft (3.0 m) of water. Flooding was anticipated to cut off access to the city around 1:00 p.m. CDT on August 28. Evacuations took place in Conroe on August 28 following release of water from the Lake Conroe dam. On the morning on August 29, a levee along Columbia Lakes in Brazoria County was breached, prompting officials to urgently request for everyone in the area to evacuate. On August 28, the U.S. Army Corps of Engineers began controlled water releases from Addicks and Barker Reservoirs in the Buffalo Bayou watershed in an attempt to manage flood levels in the immediate area. According to the local Corps commander, "It's going to be better to release the water through the gates directly into Buffalo Bayou as opposed to letting it go around the end and through additional neighborhoods and ultimately into the bayou." At the time the releases started, the reservoirs had been rising at more than 6 inches (150 mm) per hour. Many people began evacuating the area, fearing a levee breach. Despite attempts to alleviate the water rise, the Addicks Reservoir reached capacity on the morning of August 29 and began spilling out. The NASA Johnson Space Center was closed to employees and visitors due to the flooding until September 5. Only the critical mission control staff remain and reside in the control rooms to monitor procedures of the International Space Station. Anyone who chooses to not [evacuate] cannot expect to be rescued and should write their social security numbers in permanent marker on their arm so their bodies can be identified. The loss of life and property is certain. GET OUT OR DIE! The Beaumont–Port Arthur metropolitan area also experienced torrential precipitation, including 32.55 in (827 mm) of rainfall in Beaumont. Rising waters of the Neches River caused the city to lose service from its main pump station, as well as its secondary water source in Hardin County, cutting water supply to the city for an unknown amount of time. Flooding to the north and east of the Houston area resulted in mandatory evacuations for portions of Liberty, Jefferson, and Tyler counties, while Jasper and Newton counties were under a voluntary evacuation. One death occurred in Beaumont when a woman exited her disabled vehicle, but was swept away. In Port Arthur, the mayor stated that the entire city was submerged by water. Hundreds of displaced residents went to the Robert A. "Bob" Bowers Civic Center for shelter, but they were evacuated again after the building began to flood. Water entered at least several hundreds of homes in Jefferson County. Heavy rainfall extended eastward into Louisiana, with the state recording up to 14.88 in (378 mm) of precipitation near the town of Iowa. In the city of Lake Charles, water reached 4 ft (1.2 m) in height, with homes flooded and hundreds of people forced to evacuate in one neighborhood alone. Throughout the state, about 500 people were rescued by August 28, while 269 people went to a shelter in southwest Louisiana, about 200 of whom were rescued from their homes. An EF2 tornado near Evangeline damaged four homes, one of which was destroyed. The tornado also damaged fences, a motorcycle, a pickup truck, and toppled three electrical poles. Map of the total rainfall from Hurricane Harvey in the United States. Rain-slicked roads were blamed for two fatal accidents in Arkansas. In Alabama, a tornado in the vicinity of Reform damaged two homes and destroyed a barn along State Route 17, while four people were hospitalized for their injuries. A possible tornado in Lamar County near Kennedy caused damage to trees and roofs. In Tennessee, more than 19,000 people lost electricity in Memphis. Low-lying streets in the area were inundated with water. One indirect death occurred in Memphis due to a weather-related head-on collision of a car and a tractor trailer on Interstate 40. Heavy rainfall in Nashville inundated a number of roads and flooded an apartment complex, resulting in the evacuation of 13 people. Overall, about 50 people in the city evacuated from flooded areas. Rain in Kentucky was blamed for a fatal car accident. On September 1, the outer bands of Harvey's remnants passed through North Carolina. Severe weather was reported across the central part of the state. Tornadoes touched down in Angier, Clayton, and Smithfield, high wind knocked out power in Fuquay-Varina, Sanford, and Holly Springs, and large hail hit parts of Wake, Harnett, and Johnston counties. In Willow Spring, hail larger than softballs damaged homes and cars. Flash flooding hit Greenville further east. Energy production in the Gulf of Mexico declined in the wake of Harvey by approximately 21% — the output dropped to 378,633 barrels per day from the original 1.75 million barrels of oil produced each day. The Eagle Ford Rock Formation (shale oil and gas) in southern Texas reduced production by 300,000 to 500,000 bpd, according to the Texas Railroad Commission. Many energy-related ports and terminals closed, delaying about fourteen crude oil tankers. About 2.25 million bpd of refining capacity was offline for several days; that is about 12% of total US capacity, with refineries affected at Corpus Christi, and later Port Arthur and Beaumont, and Lake Charles, Louisiana. The price of Brent crude versus West Texas Intermediate crude oil achieved a split of U.S. $5. Two ExxonMobil refineries had to be shut down following related storm damage and releases of hazardous pollutants. Two oil storage tanks owned by Burlington Resources Oil and Gas collectively spilled 30,000 gallons of crude in DeWitt County. An additional 8,500 gallons of wastewater was spilled in the incidents. On August 30, the CEO of Arkema warned one of its chemical plants in Crosby, Texas, could explode or be subject to intense fire due to the loss of "critical refrigeration" of materials. All workers at the facility and residents within 1.5 mi (2.4 km) were evacuated. Eight of the plant's nine refrigeration units failed without power, enabling the stored chemicals to decompose and become combustible. Two explosions occurred around 2:00 a.m. on August 31; 21 emergency personnel were briefly hospitalized. Due to the shutdown in refineries, gas prices did see an increase nationwide. However, the increase was not as extensive as Hurricane Katrina due to the development of more fuel-efficient vehicles as well as fracking technology having been refined since Katrina to allow oil drilling in shale areas such as the Marcellus Formation. Additionally, Harvey's impact coincided with Labor Day Weekend, which sees a traditional increase in gas prices due to the heavy travel for that weekend. Nonetheless, the spike brought the highest gas prices in two years. In the aftermath of the storm, the Houston Astros began wearing this patch during the 2017 season in support of the storm's victims in Houston. They eventually went on to win the World Series. The flooding in Houston from the storm required the traditional Governor's Cup National Football League preseason game between the Dallas Cowboys and the Houston Texans scheduled for August 31 to be moved from NRG Stadium in Houston to AT&T Stadium in Arlington, Texas. The game was later cancelled to allow the Houston Texans players to return to Houston after the storm. In addition, the Houston Astros were forced to move their August 29–31 series with the Texas Rangers from Minute Maid Park in Houston to Tropicana Field in St. Petersburg, Florida; ironically, just two weeks later, Hurricane Irma would force the stadium's regular tenants, the Tampa Bay Rays, to move three home games to Citi Field in New York City. 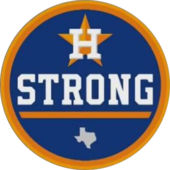 In the aftermath, the Houston Astros began to wear patches which had the logo of the team with the word "Strong" on the bottom of the patch, as well as promoting the hashtag Houston Strong, prominently displaying them as the Astros won the 2017 World Series. Manager A. J. Hinch has stated in an interview that the team wasn't just playing for a title, but to help boost moral support for the city. The annual Texas Kickoff game that was to feature BYU and LSU to kick off the 2017 college football season was moved to the Mercedes-Benz Superdome in New Orleans, Louisiana. The NCAA FBS football game between Houston and UTSA was postponed due to the aftermath of the storm. It was originally scheduled for September 2 at the Alamodome in San Antonio and was ultimately canceled. The Houston Dynamo rescheduled a planned Major League Soccer match against Sporting Kansas City on August 26 to October 11. The Houston Dash of the National Women's Soccer League rescheduled their August 27 match against the North Carolina Courage to a date that has not been announced. Both teams moved their training camps to Toyota Stadium in Frisco, Texas (near Dallas) while preparing for their next matches; the Dash's match the following week, against the Seattle Reign, will be played in Frisco, with all proceeds from ticket sales benefiting an American Red Cross relief fund for hurricane victims. The Dynamo and Major League Soccer also donated a combined $1 million into the hurricane relief fund, while also opening BBVA Compass Stadium to accept donated supplies for processing and distribution. Athletic events were rescheduled as far away as Kentucky, where the storm's remnants were expected to cause heavy rains on September 1, interfering with Friday night high school football. More than 50 high schools in the state moved games that had been scheduled for Friday to either Thursday or Saturday. Houston Mayor Sylvester Turner imposed a mandatory curfew on August 29 from 12 a.m. to 5 a.m. local time until further notice. He cited looting as the primary reason for the curfew. On August 29, President Trump, First Lady Melania Trump, and U.S. Senators John Cornyn and Ted Cruz toured damage in the Corpus Christi metropolitan area. President Trump made a formal request for $5.95 billion in federal funding on August 31 for affected areas, the vast majority of which would go to FEMA. Texas Governor Greg Abbott deployed the state's entire National Guard for search and rescue, recovery, and clean up operations due to the devastating damage caused by the storm and resulting floods. Other states' National Guard's have offered assistance, with several having already been sent. Meanwhile, the United States Immigration and Customs Enforcement assigned approximately 150 employees from around the country to assist with disaster relief efforts, while stating that no immigration enforcement operations would be conducted. Approximately 32,000 people were displaced in shelters across the state by August 31. The George R. Brown Convention Center, the state's largest shelter, reached capacity with 8,000 evacuees. The NRG Center opened as a large public shelter accordingly. More than 210,000 people registered with FEMA for disaster assistance. The Cajun Navy, an informal organization of volunteers with boats from Louisiana, deployed to Texas to assist in high-water rescues. The Houston Independent School District announced that all students on any of the district's campuses would be eligible for free lunch throughout the 2017–18 school year. The Federal Department of Education eased financial aid rules and procedures for those affected by Harvey, giving schools the ability to waive paperwork requirements; loan borrowers were given more flexibility in managing their loan payments. A 36-year-old inmate sentenced to death for a 2003 murder was granted a temporary reprieve as a result of Harvey, as his legal team was based in Harris County, an area heavily affected by the hurricane. By August 30, corporations across the nation collectively donated more than $72 million to relief efforts, with 42 companies donating at least $1 million. Professional athletic teams, their players, and managers provided large donations to assist victims of the storm. The Houston Astros pledged $4 million to relief along with all proceeds from their home game raffles. Houston Rockets owner Leslie Alexander also donated $4 million to the cause. A fundraiser established by Houston Texans defensive lineman J. J. Watt exceeded $37 million. For his efforts, Watt received the Walter Payton NFL Man of the Year Award. The Texas Rangers and Tennessee Titans both provided $1 million, while the New England Patriots pledged to match up to $1 million in donations to the Red Cross. Multiple Hollywood celebrities also pitched in, collectively donating more than $10 million, with Sandra Bullock providing the largest single donation of $1 million. Leonardo DiCaprio provided $1 million to the United Way Harvey Recovery Fund through his foundation. President Donald Trump donated $1 million to 12 charities involved in relief efforts. Rachael Ray provided donations totaling $1 million to animal shelters across the Houston area. Moody's Analytics initially estimated the total economic cost of the storm at $81 billion to $108 billion or more; most of the economic losses are damage to homes and commercial property. Reinsurance company Aon Benfield estimated total economic losses at $100 billion, including $30 billion in insured damage, making Harvey the costliest disaster in 2017 by their calculations. USA Today reported an AccuWeather estimate of $190 billion, released August 31. On September 3, Texas state governor Greg Abbott estimated that damages will be between $150 billion and $180 billion, surpassing the $120 billion that it took to rebuild New Orleans after Katrina. According to weather analytics firm Planalytics, lost revenue to Houston area retailers and restaurants alone will be approximately $1 billion. The Houston area controls 4% of the spending power in the United States. In September 2017, the Insurance Council of Texas estimated the total insured losses from Hurricane Harvey at $19 billion. This figure represents $11 billion in flood losses insured by the National Flood Insurance Program (NFIP), $3 billion in "insured windstorm and other storm-related property losses"; and about $4.75 billion in insured flood losses of private and commercial vehicles. By January 1, 2018, payouts from the NFIP reached $7.6 billion against total estimated losses of $8.5–9.5 billion. Economists Michael Hicks and Mark Burton at Ball State University estimated damage in the Houston metropolitan area alone at $198.63 billion. Preliminary reporting from the National Oceanic and Atmospheric Administration set a more concrete total at $125 billion, making Harvey the 2nd costliest tropical cyclone on record, behind Hurricane Katrina with 2017 costs of $161 billion (after adjusting for inflation). A significant portion of the storm's damages are uninsured losses. Regular homeowner insurance policies generally exclude coverage for flooding, as the NFIP underwrites most flood insurance policies in the US. Although the purchase of flood insurance is obligatory for federally guaranteed mortgages for homes within the 100-year flood plain, enforcement of the requirement is difficult and many homes, even within the 100-year flood plain, lack flood insurance. In Harris County, Texas—which includes the city of Houston—only 15% of homes have flood insurance policies issued by the NFIP. Participation in the NFIP is higher, but still low, in neighboring Galveston (41%), Brazoria (26%), and Chambers Counties (21%). Homeowners sued authorities after reservoir releases damaged homes. 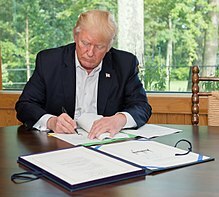 On September 8, President Donald Trump signed into law H.R. 601, which among other spending actions designated $15 billion for Hurricane Harvey relief. The American Red Cross, Salvation Army, United Methodist Committee on Relief (UMCOR), Gulf Coast Synod Disaster Relief, United States Equestrian Federation, Humane Society of the United States, Knights of Columbus, Catholic Charities USA, AmeriCares, Operation BBQ relief, many celebrities, and many other charitable organizations provided help to the victims of the storm. Anarchists (including Antifa) also provided relief. [better source needed] Business aviation played a part in the rescue efforts, providing support during the storm as well as relief flights bringing in suppliers in the immediate aftermath. Many corporations also contributed to relief efforts. Operation BBQ relief had the help from several local individuals and businesses kick off the support of providing meals for volunteers and victims. Smokers, pallets of wood, and another company came up with the pounds of pork to kick off the support effort. Although Operation BBQ relief has been in effect since May 2011 with the 2011 Joplin tornado, they estimate the Houston 2017 relief project to be their biggest ever. Operation BBQ relief vendors volunteering for the Houston flood relief estimates that they will serve at least 450,000 meals. On August 27, 2017 it was estimated that Operation BBQ relief will be expecting 25,000 to 30,000 meals a day. On August 27, 2017, KSL-TV, KSL Newsradio, FM100.3, and 103.5 The Arrow created a fundraiser to help Texas residents impacted by Hurricane Harvey. Because of an anonymous donor willing to match $2 for every $1 raised up to a total of $100,000, Peter Huntsman also agreed to match donations up to $100,000. The combined total of $200,000 was met by August 31, 2017. Their new goal is $1 million. Singapore dispatched Boeing CH-47 Chinook helicopters from the Republic of Singapore Air Force to areas affected by the hurricane for humanitarian operations, working alongside the Texas National Guard. Israel pledged $1 million in relief funds for restoration of non-state run communal infrastructure. Mexico sent volunteers from the Mexican Red Cross, firemen from Coahuila, and rescue teams from Guanajuato to Houston to assist in relief. Mexico later rescinded their commitment for aid after Hurricane Katia made landfall on Mexico's Gulf Coast, on September 9, 2017. Venezuela offered $5 million through the state-owned Citgo Petroleum, which operates a refinery in Corpus Christi. The floodwaters contain a number of hazards to the environment and human health. The Houston Health Department stated that "millions of contaminants" were present in floodwaters. These include E. coli and coliform bacteria; measurements of colony-forming units showed the concentrations were so high that there were risks of contracting flesh-eating disease from the water. Houston officials stated that the Houston drinking water and sewer systems were intact; however, "hundreds of thousands of people across the 38 Texas counties affected by Hurricane Harvey use private wells, according to an estimate by Louisiana State University researchers, and those people must fend for themselves." Additionally, Harris County, which includes Houston, contains a large number of Superfund-designed brownfield sites that contain a wide variety of toxins and carcinogens. Two Superfund sites in Corpus Christi were flooded. In the months after the hurricane struck, some hospitals in Texas saw a spike in birth rates, with a 17% increase in birth rates being reported at Corpus Christi Medical Center. A similar, larger baby boom also occurred after Hurricane Sandy in 2012. On April 11, 2018, at the 40th session of the RA IV hurricane committee, the World Meteorological Organization retired the name Harvey from its rotating name lists, due to the extensive damage and loss of life it caused along its track, particularly in the state of Texas, and its name will never again be used for another Atlantic hurricane. It will be replaced with Harold for the 2023 season. 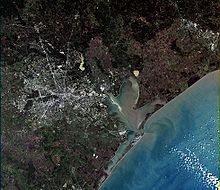 The geography of Houston places it in a low-lying part of the Gulf Coastal Plain, and its clay-based soils provide poor drainage. The climate of Houston brings very heavy rainfall, which together with tidal flood events means that there have been repeated floods in the city ever since its founding in 1836, though the flood control district founded in 1947, aided by the U.S. Army Corps of Engineers, managed to prevent statewide flooding for over fifty years. More recently, residents died in "historic flooding" in May 2015, and in the April 2016 "tax day floods". 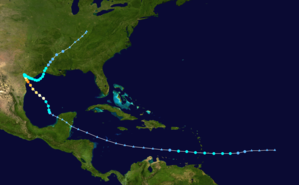 There is a tendency for storms to move very slowly over the region, allowing them to produce tremendous amounts of rain over an extended period, as occurred during Tropical Storm Claudette in 1979, and Tropical Storm Allison in 2001. The area is a very flat flood plain at shallow gradient, slowly draining rainwater through an intricate network of channels and bayous to the sea. The main waterways, the San Jacinto River and the Buffalo Bayou, meander slowly, laden with mud, and have little capacity for carrying storm water. Houston has seen rapid urban development (urban sprawl), with absorbent prairie and wetlands replaced by hard surfaces which rapidly shed storm water, overwhelming the drainage capacity of the rivers and channels. Between 1992 and 2010, almost 25,000 acres of wetlands were lost, decreasing the detention capacity of the region by four billion gallons. However, Harvey was estimated to have dropped more than fifteen trillion gallons of water in the area. The Katy Prairie in western Harris County, which once helped to absorb floodwaters in the region, has been reduced to one quarter of its previous size in the last several decades due to suburban development, and one analysis discovered that more than 7,000 housing units have been built within the 100-year floodplain in Harris County since 2010. As Houston has expanded, rainwater infiltration in the region has lessened and aquifer extraction increased, causing the depletion of underground aquifers. When the saturated ground dries, the soil can be compressed and the land surface elevation decreases in a process called subsidence. Subsidence can also occur due to sediment settling. Specifically, regions to the north and west of the Houston metro have seen 10 millimetres (0.39 in) to 25 millimetres (0.98 in) of subsidence per year. While oil extraction can cause subsidence, in the Houston-Galveston area, most oil has been extracted from sandstone that has relatively negligible ability to compress once oil has been removed. Thus, oil extraction has not resulted in significant subsidence. Further, the volume of oil extraction in the Houston area is too low to cause significant subsidence. The Gulf of Mexico is known for hurricanes in August, so their incidence alone cannot be attributed to global warming, but the warming climate does influence certain attributes of storms. Studies in this regard show that storms tend to intensify more rapidly prior to landfall. Weather events are due to multiple factors, and so cannot be said to be caused by one precondition, but climate change affects aspects of extreme events, and very likely worsened some of the impacts of Harvey. In a briefing, the World Meteorological Organization stated that the quantity of rainfall from Harvey had very likely been increased by climate change. The relationship between climate change and the frequency of hurricanes (or tropical cyclones) is still unclear, and is the subject of continuing research. The recent increases in activity are linked, in part, to higher sea surface temperatures in the region that Atlantic hurricanes form in and move through. Numerous factors have been shown to influence these local sea surface temperatures, including natural variability, human-induced emissions of heat-trapping gases, and particulate pollution. Quantifying the relative contributions of natural and human-caused factors is an active focus of research. Warmer air can hold more water vapor, in accordance with the Clausius–Clapeyron relation, and there has been a global increase of daily rainfall records. Regional sea surface temperatures around Houston have risen around 0.5 °C (0.9 °F) in recent decades, which caused a 3–5% increase in moisture in the atmosphere. This had the effect of allowing Harvey to strengthen more than expected. The water temperature of the Gulf of Mexico was above average for this time of the year, and likely to be a factor in Harvey's impact. Within a week of Harvey, Hurricane Irma formed in the eastern Atlantic, due to the similar conditions involving unusually warm seawater. Some scientists fear this may be becoming a 'new normal'. Also higher sea-water temperatures can make hurricanes more devastating. The slow movement of Harvey over Texas allowed the storm to drop prolonged heavy rains on the state, as has also happened with earlier storms. Harvey's stalled position was due to weak prevailing winds linked to a greatly expanded subtropical high pressure system over much of the US at the time, which had pushed the jet stream to the north. Research and model simulations have indicated an association between this pattern and human-caused climate change. Wikimedia Commons has media related to Hurricane Harvey. ^ A major hurricane is a hurricane that ranks as Category 3 or higher on the Saffir–Simpson scale. ^ All damage figures in this table are in the USD amounts of their respective year. ^ a b Costliest U.S. tropical cyclones tables update (PDF) (Report). United States National Hurricane Center. January 12, 2018. Archived (PDF) from the original on January 26, 2018. Retrieved January 12, 2018. ^ Mooney, Chris. "Energy and Environment The science behind the U.S.'s strange hurricane 'drought' — and its sudden end". Washington Post. Washington Post. Retrieved July 14, 2018. ^ a b Beven. "Tropical Storm HARVEY". National Hurricane Center. NOAA. Retrieved July 14, 2018. ^ a b Berg. "Remnants of HARVEY". National Hurricane Center. NOAA. Retrieved July 14, 2018. ^ a b Blake. "Tropical Depression HARVEY". National Hurricane Center. NOAA. Retrieved July 14, 2018. ^ Berg / Brennan. "Hurricane HARVEY". National Hurricane Center. NOAA. Retrieved July 14, 2018. ^ a b Blake. "Hurricane HARVEY". National Hurricane Center. NOAA. Retrieved July 14, 2018. ^ Brennan. "Tropical Storm HARVEY". National Hurricane Center. NOAA. Retrieved July 14, 2018. ^ Brown. "Tropical Storm HARVEY". National Hurricane Center. NOAA. Retrieved July 14, 2018. ^ Brown. "Tropical Depression Harvey". National Hurricane Center. NOAA. Retrieved July 14, 2018. ^ a b Billion-Dollar Weather and Climate Disasters: Table of Events (Report). National Oceanic and Atmospheric Administration. January 8, 2018. Retrieved January 8, 2018. ^ a b c d e f g h i Eric S. Blake; David A. Zelinsky (January 23, 2018). Hurricane Harvey (AL092017) (PDF) (Report). Tropical Cyclone Report. National Hurricane Center. Retrieved January 29, 2018. ^ Beven II, John L. (August 17, 2017). "Potential Tropical Cyclone Nine Public Advisory Number 1". National Hurricane Center. Miami, Florida: United States Government. Retrieved August 24, 2017. ^ Beven II, John L. (August 18, 2017). "Tropical Storm Harvey Intermediate Advisory Number 5A". National Hurricane Center. Miami, Florida: United States Government. Retrieved August 25, 2017. ^ "Harvey se acerca a Honduras como depresión tropical". La Prensa (in Spanish). San Pedro Sula: Organización Publicitaria, S.A. August 19, 2017. Retrieved August 28, 2017. ^ "Levantan la alerta azul Tormenta Harvey". Tribuna de Campeche (in Spanish). Campeche. August 21, 2017. Retrieved August 28, 2017. ^ Blake, Eric S. (August 23, 2017). "Tropical Depression Harvey Advisory Number 12". National Hurricane Center. Miami, Florida: United States Government. Retrieved August 25, 2017. ^ Berg, Robbie J. (August 25, 2017). "Tropical Storm Harvey Advisory Number 22". National Hurricane Center. Miami, Florida: United States Government. Retrieved August 28, 2017. ^ Fandos, Nicholas (August 25, 2017). "Trump Administration Prepares for Hurricane Harvey". The New York Times. New York City: The New York Times Company. Retrieved August 26, 2017. ^ "Severe Weather Statement: Extreme Wind Warning". National Weather Service in Corpus Christi, Texas. Iowa Environmental Mesonet National Weather Service. August 24, 2017. Retrieved February 5, 2018. ^ Nestel, M. L. (August 25, 2017). "Harvey expected to make landfall as a major hurricane". ABC News. New York City: ABC. Retrieved August 25, 2017. ^ a b c Dart, Tom; Helmore, Edward (August 26, 2017). "Hurricane Harvey: at least one dead in Texas as storm moves inland". The Guardian. London: Guardian Media Group. Retrieved August 27, 2017. ^ "Cyclone in the U.S." International Charter on Space and Major Disasters. August 24, 2017. Retrieved August 28, 2017. ^ James Crugnale (August 25, 2017). "Hurricane Harvey: Louisiana Gov. Urges Residents to Remain Vigilant as Storm Strikes Texas". The Weather Channel. Atlanta: Landmark Communications (1982–2008) / Consortium made up of The Blackstone Group, Bain Capital, and NBCUniversal (2008–). Retrieved August 26, 2017. ^ Amy, Jeff; Kunzelman, Michael (August 29, 2017). "Haunted by Katrina's memory, Louisiana now faces Harvey". Chicago Tribune. Chicago: Troc Inc. Associated Press. Retrieved August 29, 2017. ^ "CDEMA Situation Report #1 – Tropical Storm Harvey – as of 4:00pm on August 18th, 2017". ReliefWeb. New York City: United Nations Office for the Coordination of Humanitarian Affairs. August 18, 2017. Retrieved August 24, 2017. ^ a b "GUYANA: Emergency Situation at Jawalla Village, Region 7". Caribbean Disaster Emergency Management Agency. Caribbean: Caribbean Community. August 22, 2017. Retrieved August 24, 2017. ^ a b Kevin Sullivan, Arelis R. Hernandez and David A. Fahrenthold (August 29, 2017). "Harvey leaving record rainfall, at least 22 deaths behind in Houston". Chicago Tribune. Washington Post. Retrieved August 30, 2017. ^ Scheyder, Ernest; Seba, Erwin (August 28, 2017). "Harvey throws a wrench into U.S. energy engine". Reuters. Canary Wharf, London: Thomson Reuters. Retrieved August 28, 2017. ^ Rust, Susanne; Sahagun, Louis (March 5, 2019). "Post-Hurricane Harvey, NASA tried to fly a pollution-spotting plane over Houston. The EPA said no". Los Angeles Times. Retrieved March 6, 2019. ^ "Harvey's toll on refineries sparks widespread gasoline shortages, price hikes". Houston Chronicle. Houston: Hearst Communications. August 31, 2017. Retrieved September 1, 2017. ^ www.oil-price.net. "Impact of Hurricanes on oil prices". oil-price.net. ^ a b c d "The Latest: Death toll 31 as 6 more fatalities confirmed". Associated Press. New York City: AP Board of Directors. August 31, 2017. Retrieved August 31, 2017. ^ "Houston residents begin 'massive' cleanup as Harvey death toll hits 45". The Guardian. London: Guardian Media Group. September 1, 2017. Retrieved September 1, 2017. ^ Elbein, Asher (September 25, 2017). "How Hurricane Harvey Affected Birds and Their Habitats in Texas." National Audubon Society. Retrieved from Audubon.org, February 5, 2019. ^ Southern, Joe (April 3, 2018). "Attwater’s prairie chickens dealt critical blow by Hurricane Harvey." Fort Bend Star. Retrieved from FortBendStar.com, February 5, 2019. ^ a b c d Breslin, Sean (August 28, 2017). "Harvey's Ground Zero: Search Continues for Missing Along Texas Coast". The Weather Channel. Atlanta: Landmark Communications (1982–2008) Consortium made up of The Blackstone Group, Bain Capital, and NBCUniversal (2008–). Retrieved August 29, 2017. ^ Tate, Jennifer Elyse (August 29, 2017). "Storm Summary Number 14 for Tropical Storm Harvey Rainfall and Wind". Weather Prediction Center. College Park, Maryland: United States Government. Retrieved August 29, 2017. ^ Breslin, Sean; Wright, Pam (August 26, 2017). "Hurricane Harvey Update: More Than 100 Evacuated from Damaged Rockport Hotel: Tens of Thousands Without Power". The Weather Channel. Atlanta: Landmark Communications (1982–2008) Consortium made up of The Blackstone Group, Bain Capital, and NBCUniversal (2008–). Retrieved August 26, 2017. ^ Phil McCausland; Daniel Arkin; Kurt Chirbas (August 27, 2017). "Hurricane Harvey: At Least 2 Dead After Storm Hits Texas Coast". NBC News. Retrieved August 27, 2017. ^ a b c Tate, Jennifer (August 29, 2017). Storm Summary Number 15 for Tropical Storm Harvey Rainfall and Wind. Weather Prediction Center (Report). College Park, Maryland: United States Government. Retrieved August 29, 2017. ^ Roth, David M. (October 18, 2017). "Tropical Cyclone Point Maxima". Tropical Cyclone Rainfall Data. United States Weather Prediction Center. Retrieved November 26, 2017. ^ Avila, Lixion (August 29, 2017). "Tropical Storm Harvey Advisory Number 37". National Hurricane Center. Miami, Florida: United States Government. Retrieved August 29, 2017. ^ Erdman, Jon; Dolce, Chris (August 29, 2017). "It's Not Over: Tropical Storm Harvey Rainfall Sets Preliminary All-Time Lower 48 States Record, Still Soaking Texas, Louisiana". The Weather Channel. Atlanta: Landmark Communications (1982–2008) Consortium made up of The Blackstone Group, Bain Capital, and NBCUniversal (2008–). ^ National Weather Service Office in Houston, Texas [@NWSHouston] (August 28, 2017). "After checking the rain gauge, a new daily rainfall record was set at the NWS Office of 16.08" beating yesterday's record of 14.40" #houwx" (Tweet). Retrieved August 28, 2017 – via Twitter. ^ "24 hours after making landfall, Harvey's rainfall prompts flash flood emergencies in Houston". WHNT-TV. Huntsville, Alabama: Tribune Broadcasting (sale to Sinclair Broadcast Group pending). August 27, 2017. Retrieved September 6, 2017. ^ National Weather Service Houston [@NWSHouston] (August 31, 2017). "Houston's August 2017 rainfall total (39.11 inches) is more than double the previous wettest month. #txwx #houwx #bcswx #Harvey" (Tweet). Retrieved August 31, 2017 – via Twitter. ^ "Hurricane Harvey". U-SURGE. Archived from the original on September 10, 2017. Retrieved September 10, 2017. ^ Fischetti, Mark (August 28, 2017). "Hurricane Harvey: Why Is It So Extreme?". Scientific American. United States: Springer Nature. ISSN 0036-8733. Retrieved September 10, 2017. ^ Eliott C. McLaughlin; Ralph Ellis; Joe Sterling. "Harvey's rain 'beyond anything experienced,' weather service says". CNN. Atlanta: Turner Broadcasting System. Retrieved August 27, 2017. ^ "Family of six counted among the dead as Harvey death toll rises to 14". Fox News Channel. August 29, 2017. Retrieved August 29, 2017. ^ St. John Barned-Smith (August 29, 2017). "Houston Police officer drowns in Harvey floodwaters". Houston Chronicle. Retrieved August 29, 2017. ^ Brenda Burr (August 28, 2017). "10 foot floods expected, evacuate by 1 p.m. today officials say". Bay City Tribune. Retrieved August 28, 2017. ^ "Dam release ramps up Conroe evacuation plans". KTRK. August 28, 2017. Retrieved August 29, 2017. ^ "Residents south of Houston urged to leave area after levee breach". KCRA3. August 29, 2017. Retrieved August 29, 2017. ^ Barned-Smith, St. John; Carpenter, Jacob; Foxhall, Emily (August 30, 2017). "Brazoria team works against the clock". Houston Chronicle. Retrieved September 5, 2017. ^ "Corps Releases at Addicks and Barker Dams to begin" (Press release). United States Army Corps of Engineers. August 28, 2017. Retrieved August 28, 2017. ^ "Conditions worsen for West Houston neighborhood". KSAT. August 29, 2017. ^ "Houston flood: Addicks dam begins overspill". BBC. August 29, 2017. Retrieved August 29, 2017. ^ "NASA's Johnson Space Center Closes for Hurricane Harvey". NASA. August 29, 2017. Retrieved August 30, 2017. ^ "East Texas county tells residents 'GET OUT OR DIE!'". KSBW. August 30, 2017. Retrieved August 30, 2017. ^ Brad Penisson (August 31, 2017). "The City of Beaumont has lost water supply". Beaumont, Texas: City of Beaumont, Texas. Retrieved August 31, 2017. ^ Brandon Scott (August 28, 2017). "Mandatory evacuations ordered in parts of Jefferson, Liberty, Tyler counties". KFDM. Retrieved August 30, 2017. ^ Brandon Scott (August 29, 2017). "Beaumont, Texas woman with small child killed in Harvey related flooding". KFDM. Retrieved August 30, 2017. ^ Travis Fedschun (August 30, 2017). "Nation's largest oil refinery in Port Arthur, Texas shut down; mayor says 'whole city is underwater'". Fox News Channel. Retrieved August 30, 2017. ^ Kelly McCarthy; Julia Jacobo (August 29, 2017). "Louisiana begins evacuations for Harvey on 12th anniversary of Hurricane Katrina". ABC News. Retrieved August 29, 2017. ^ Public Information Statement (Report). National Weather Service Lake Charles, Louisiana. August 31, 2017. Archived from the original on September 1, 2017. Retrieved September 1, 2017. ^ Brandon Riddle (August 31, 2017). "Police: Boy killed after vehicle leaves rain-soaked Arkansas road, strikes tree". Arkansas Online. Retrieved August 31, 2017. ^ Emma Pettit (August 31, 2017). "Pickup driver, 21, killed in head-on collision on wet highway in Arkansas". Arkansas Online. Retrieved August 31, 2017. ^ Stephanie Taylor (August 31, 2017). "Tornado causes damage in Pickens County". The Tuscaloosa News. Retrieved September 1, 2017. ^ Eric Chaney (September 1, 2017). "Harvey Beyond Houston: Possible Tornado Causes Damage in Alabama; Tennessee Flooding Prompts Evacuations". The Weather Channel. Retrieved September 1, 2017. ^ "Harvey brings destruction through Alabama to Tennessee". The Birmingham News. September 1, 2017. Retrieved September 1, 2017. ^ Bart Jansen (September 1, 2017). "Harvey floods Tennessee, Kentucky, as Hurricane Irma spins up in the Atlantic". USA Today. Retrieved September 1, 2017. ^ "1 person killed in crash on I-40 in Shelby County". WKYT. September 1, 2017. Retrieved September 2, 2017. ^ "U.S.: Hurricane Harvey's Toll on Texas Energy". Stratfor. August 28, 2017. ^ "ExxonMobil refineries are damaged in Hurricane Harvey, releasing hazardous pollutants". The Washington Post. August 29, 2017. ^ "The Latest: Death toll 31 as 6 more fatalities confirmed". Miami Herald. August 30, 2017. Retrieved August 31, 2017. ^ "Harvey aftershock: Chemical plant near Houston could explode, CEO says". Fox News Channel. August 30, 2017. Retrieved August 31, 2017. ^ "Harvey Live Updates: In Crosby, Texas, Blasts at a Chemical Plant and More Are Feared". The New York Times. August 31, 2017. Retrieved August 31, 2017. ^ "Texas refineries begin restart after hit from Harvey". Reuters. September 2, 2017. ^ a b "Gas prices up to 2-year high after Hurricane Harvey". CBS News. September 1, 2017. Retrieved September 4, 2017. ^ "Harvey spikes N.J. gas prices ahead of holiday weekend. How high will they go?". NJ.com. Retrieved September 4, 2017. ^ "Cowboys-Texans game relocated to AT&T Stadium". NFL. August 28, 2017. Retrieved August 28, 2017. ^ Jori Epstein (August 30, 2017). "Cowboys-Texans game canceled to give Houston players chance to go home after Harvey". The Dallas Morning News. Retrieved August 30, 2017. ^ "TEX-HOU moved to Rays' park; millions donated". MLB. August 29, 2017. ^ "Yanks-Rays series off to Citi Field due to Irma". ^ Pingue, Frank (October 23, 2017). "Astros give Houston boost during Hurricane Harvey recovery". Reuters. Retrieved October 30, 2017. ^ Dart, Tom (October 28, 2017). "World Series unites Houston as road to hurricane recovery winds on". The Guardian. Retrieved October 30, 2017. ^ Baxter, Kevin (October 28, 2017). "Astros playing for more than a title in hurricane-ravaged Houston". Los Angeles Times. Retrieved October 30, 2017. ^ "LSU-BYU game moving from Houston to New Orleans". SB Nation. ^ "No Houston Teams to Compete This Weekend". UHCOUGARS.com. August 29, 2017. Retrieved August 30, 2017. ^ Corey Roepken (August 25, 2017). "Dynamo, Dash games postponed due to Hurricane Harvey". Houston Chronicle. Retrieved August 31, 2017. ^ "Houston Dynamo & Dash to train in North Texas for remainder of the week". Houston Dynamo. August 30, 2017. Retrieved August 31, 2017. ^ Corey Roepken (August 31, 2017). "Dynamo, MLS combine for $1 million Hurricane Harvey donation". Houston Chronicle. Retrieved August 31, 2017. ^ "BBVA Compass Stadium at capacity; no longer collecting donations for storm relief". Houston Dynamo. August 30, 2017. Retrieved August 31, 2017. ^ Josh Moore (August 30, 2017). "List of high school football games moving due to Hurricane Harvey weather system". Lexington Herald-Leader. Lexington, Kentucky. Retrieved August 31, 2017. ^ Blair Shiff; Julia Jacobo; Emily Shapiro (August 29, 2017). "Houston mayor imposes curfew to prevent potential looting". ABC News. Retrieved August 29, 2017. ^ Alex Pappas (August 29, 2017). "Trump surveys Harvey damage, calls for recovery 'better than ever before'". Fox News Channel. Retrieved August 30, 2017. ^ Perry Chiaramonte (September 1, 2017). "Trump pushing for $6 billion in Harvey recovery funding". Fox News Channel. Retrieved September 1, 2017. ^ "Governor Abbott Activates Entire Texas National Guard In Response To Hurricane Harvey Devastation". Office of the Texas Governor (Press release). August 28, 2017. Retrieved August 30, 2017. ^ Leada Gore (August 28, 2017). "Hurricane Harvey latest forecast: Texas National Guard activated; Trump responds; how to help". AL.com. Retrieved August 30, 2017. ^ Jake Lowary (August 29, 2017). "Tennessee National Guard: We're ready for Hurricane Harvey response". Tennessean. Retrieved August 30, 2017. ^ Scott Wise (August 30, 2017). "Va. National Guard helps Hurricane Harvey recovery". WTVR. Retrieved August 30, 2017. ^ "Explosions and Black Smoke Reported at Chemical Plant". The New York Times. August 31, 2017. Retrieved August 31, 2017. ^ Edmund D. Fountain and Trip Gabriel (August 30, 2017). "'Cajun Navy' Brings Its Rescue Fleet to Houston's Flood Zone". The New York Times. Retrieved August 31, 2017. ^ Kaya Yurieff (August 30, 2017). "Businesses donate over $72 million to Harvey relief efforts". CNN Money. Retrieved August 31, 2017. ^ Olivia Pulsinelli (August 29, 2017). "Astros owner, foundation commit $4M to Harvey relief; Crane Worldwide launches donation effort". Houston Business Journal. Retrieved August 31, 2017. ^ "J.J. Watt wins Walter Payton NFL Man of the Year Award for Hurricane Harvey relief efforts". USA Today. February 3, 2018. Retrieved February 4, 2018. ^ Scott Polacek (August 29, 2017). "Texas Rangers Donate $1 Million to Hurricane Harvey Relief". Bleacher Report. Retrieved August 31, 2017. ^ Sarah Polus (August 30, 2017). "Celebrities open their hearts – and checkbooks – to Harvey victims". The Washington Post. Retrieved August 31, 2017. ^ Erin Jensen (August 29, 2017). "Leonardo DiCaprio, the Kardashians, more celebs pledge donations for Hurricane Harvey relief efforts". USA Today. Retrieved August 31, 2017. ^ Manchester, Julia; Greenwood, Max (September 16, 2017). "Trump makes good on pledge to donate to Harvey relief". The Hill. Retrieved September 19, 2017. The Hill confirmed with multiple groups that they received the funds this week. ^ Ana Calderone (August 30, 2017). "Rachael Ray Donates $1 Million to Support Animal Rescue in Texas Flood Areas". People. Retrieved August 31, 2017. ^ Costliest U.S. tropical cyclones tables update (PDF) (Report). United States National Hurricane Center. January 12, 2018. Archived from the original on January 12, 2018. Retrieved January 12, 2018. ^ "Assessing the U.S. Climate in 2018". National Centers for Environmental Information (NCEI). February 6, 2019. Retrieved February 9, 2019. ^ Don Lee (September 1, 2017). "Harvey is likely to be the second-most costly natural disaster in U.S. history". Los Angeles Times. ^ "Insured Natural Disaster Losses in 2017 Were 38% of Economic Costs of $353B: Aon". Insurance Journal. January 24, 2018. Retrieved January 29, 2017. ^ Doyle Rice (August 30, 2017). "Harvey to be costliest natural disaster in U.S. history, with an estimated cost of $190 billion". USA Today. ^ Gary McWilliams; Parraga Marianna. "Texas governor says Harvey damage could reach $180 billion". Reuters. Retrieved September 3, 2017. ^ Oliver Milman. "Harvey recovery bill expected to exceed the $120bn required after Katrina". The Guardian. Retrieved September 3, 2017. ^ Adrianne Pasquarelli (August 28, 2017). "Harvey Blasts Brands: Could Cost More Than $1B in Sales". Advertising Age. Retrieved August 29, 2017. ^ "ICT Pegs Hurricane Harvey Insured Losses at $19B". Insurance Journal. September 15, 2017. Retrieved September 15, 2017. ^ Andrew G. Simpson (January 8, 2018). "FEMA Expands Flood Reinsurance Program with Private Reinsurers for 2018". Insurance Journal. Retrieved January 29, 2018. ^ Michael Hicks and Mark Burton (September 8, 2017). Hurricane Harvey: Preliminary Estimates of Commercial and Public Sector Damages on the Houston Metropolitan Area (PDF) (Report). Ball State University. Retrieved November 1, 2017. ^ a b c Mary Williams Walsh (August 28, 2017). "Homeowners (and Taxpayers) Face Billions in Losses From Harvey Flooding". The New York Times. Retrieved August 30, 2017. ^ Chris Isidore (August 26, 2017). "Most homes in Tropical Storm Harvey's path don't have flood insurance". CNN. Retrieved August 30, 2017. ^ Sims, Bryan (September 13, 2017). "Harvey storm-water releases were unlawful government takings: lawsuits". Retrieved September 13, 2017 – via Reuters. ^ "News Wrap: Trump signs $15 billion Hurricane Harvey relief bill". PBS Newshour. September 8, 2017. Retrieved September 27, 2017. ^ "Gulf Coast Synod Disaster Relief". www.facebook.com. Retrieved December 22, 2017. ^ "Hurricane Harvey - Gulf Coast Synod". Gulf Coast Synod. August 27, 2017. Retrieved December 22, 2017. ^ "Salvation Army Accepting Hurricane Harvey Relief Donations In Tulsa". News On 6 Tulsa. September 1, 2017. ^ Janet Patton (September 1, 2017). "Harvey equine relief tops $150,000; supply list available for donors". Lexington Herald Leader. ^ Perri Blumberg (August 30, 2017). "Animal Rescue Groups in Texas Need Your Help—Here's What You Can Do". Yahoo News Southern Living. ^ "The Red Cross Won't Save Houston. Texas Residents Are Launching Community Relief Efforts Instead". Democracy Now!. August 30, 2017. Retrieved September 2, 2017. ^ Bernd, Candice (September 7, 2017). "Antifa and leftists organize mutual aid and rescue networks in Houston". Salon. Retrieved August 4, 2018. ^ Gollan, Doug. "After Harvey, As Irma Bears Down On Florida, Here's How Business Aviation Plays A Critical Role". ^ "Amateur Radio Volunteers Assisting Where Needed in Hurricane Response". ARRL. August 30, 2017. ^ Greg Morago (August 30, 2017). "Operation BBQ Relief pulls into Houston to comfort, nourish with smoked meat". Houston Chronicle. ^ Kevin Kilbane (September 1, 2017). "Fort Wayne residents pitching in to help Hurricane Harvey victims". Fort Wayne News Sentinel. ^ Mike Lacy (August 27, 2017). "Operation BBQ Relief ready and waiting to help flood victims". WLOX ABC News. ^ "KSL Hope for Houston: Help us raise $1M to help with Harvey recovery". KSL News. August 31, 2017. ^ "RSAF Chinooks arrive to assist in Hurricane Harvey disaster relief". ^ Sarah Levi (September 4, 2017). "In Wake of Harvey Devastation, Israel Pledges $1M. to Houston's Jewish Community". The Jerusalem Post. Retrieved September 4, 2017. ^ Corchado, Alfredo (August 31, 2017). "Abbott says Texas will accept Mexican offer of Hurricane Harvey relief". Dallas News. Retrieved September 8, 2017. ^ "Mexico says it will not be possible to help Texas with recovery efforts". Newsweek. September 11, 2017. Retrieved September 19, 2017. ^ Amanda Erickson (August 30, 2017). "America sanctioned Venezuela. Then it offered $5 million in aid to Harvey victims". The Washington Post. Retrieved September 9, 2017. ^ a b c d Hiroko Tabuchi & Shelia Kaplan, A Sea of Health and Environmental Hazards in Houston's Floodwaters, New York Times (August 31, 2017). ^ "Floodwater from Harvey loaded with E. coli". Erin Burnett OutFront. CNN. September 1, 2017. ^ Danielle Garrand (May 29, 2018). "Hurricane Harvey babies: Some hospitals see spike in births months after the storm". CBS News. Retrieved May 31, 2018. ^ "Hurricane names Harvey, Irma, Maria and Nate being retired". Associated Press. Washington Post. April 12, 2018. Retrieved April 12, 2018. ^ Adam Gabbatt (August 28, 2017). "What makes Houston so vulnerable to serious floods?". the Guardian. Retrieved August 30, 2017. ^ Justin Fox (August 29, 2017). "How to Make 500-Year Storms Happen Every Year". Bloomberg.com. Retrieved August 30, 2017. ^ a b "How A Warmer Climate Helped Shape Harvey". NPR.org. August 28, 2017. Retrieved August 30, 2017. ^ Ralph Vartabedian (August 29, 2017). "For years, engineers have warned that Houston was a flood disaster in the making. Why didn't somebody do something?". Los Angeles Times. Retrieved August 31, 2017. ^ Manny Fernandez; Richard Fausset (August 27, 2017). "A Storm Forces Houston, the Limitless City, to Consider Its Limits". The New York Times. Retrieved August 31, 2017. ^ Campoy, Ana; Yanofsky, David (August 29, 2017). "Houston's flooding shows what happens when you ignore science and let developers run rampant". Retrieved September 12, 2017. ^ Herriges, Daniel (August 30, 2017). "Houston isn't flooded because of its land use planning". Retrieved September 12, 2017. ^ Henry Grabar (August 27, 2017). "Houston Wasn't Built for a Storm Like This". Slate. Retrieved August 29, 2017. ^ a b Jiangbo Yu; et al. (July 2, 2014). "Is There Deep-Seated Subsidence in the Houston-Galveston Area?". Retrieved December 14, 2017. ^ "Oil Wells and Production in Harris County, TX". Retrieved December 14, 2017. ^ a b "What you can and can't say about climate change and Hurricane Harvey". The Washington Post. August 27, 2017. ^ a b c Stefan Rahmstorf. "Storm Harvey: impacts likely worsened due to global warming". Potsdam Institute for Climate Impact Research Research Portal. Retrieved August 31, 2017. ^ Tom Miles (August 29, 2017). "Storm Harvey's rainfall likely linked to climate change: U.N." Reuters U.K. Retrieved August 31, 2017. ^ "Did Climate Change Intensify Hurricane Harvey?". The Atlantic. August 27, 2017. ^ "Houston is experiencing its third '500-year' flood in 3 years. How is that possible?". The Washington Post. August 30, 2017. ^ Joyce, Christpher (September 8, 2017). "Hurricanes Are Sweeping The Atlantic. What's The Role Of Climate Change?". NPR. Washington, D.C.: National Public Radio, Inc. Retrieved September 9, 2017. ^ Meyer, Robinson (August 27, 2017). "Did Climate Change Intensify Hurricane Harvey?". The Atlantic. Washington, D.C.: Atlantic Media. Retrieved September 9, 2017. ^ "Extreme Weather". National Climate Assessment. ^ a b Michael E. Mann (August 28, 2017). "It's a fact: climate change made Hurricane Harvey more deadly". the Guardian. Retrieved August 28, 2017. ^ "How Hurricane Harvey Became So Destructive". The New York Times. August 28, 2017. ^ Watts, Jonathan (September 6, 2017). "Twin megastorms have scientists fearing this may be the new normal". The Guardian. Kings Place, London: Guardian Media Group. Retrieved September 9, 2017. ^ Michael E. Mann; Stefan Rahmstorf; Kai Kornhuber; Byron A. Steinman; Sonya K. Miller; Dim Coumou (March 27, 2017). "Influence of Anthropogenic Climate Change on Planetary Wave Resonance and Extreme Weather Events". Scientific Reports. Springer Nature. 7: 45242. Bibcode:2017NatSR...745242M. doi:10.1038/srep45242. ISSN 2045-2322. Wikimedia Commons has media related to Hurricane Harvey (2017).